Howard Webb sent in this postcard 'Photo by J Johnson & Co., Layton Road, Brentford' on the back. John Johnson worked as a postman and a postman features in the image. This is the second of his postcards on the site, the other shows The Ride. The card was postmarked Brentford, April 16 1913 at 8.15 pm. It shows a view looking north along Windmill Road, taken from the junction with Eastbourne Road to the right. Boston Park Road is to the left, with the Globe PH on the corner, and Grove Road is a little further on to the right. 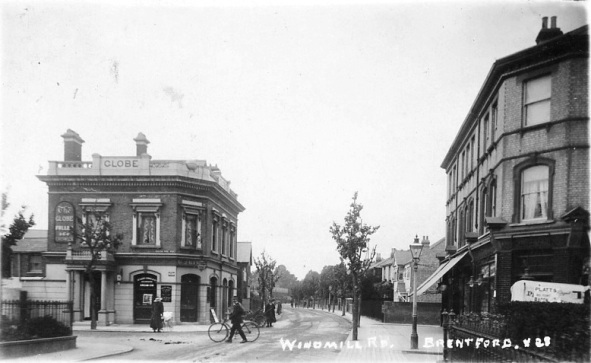 There is a similar view of the Globe in 'Brentford and Chiswick Pubs' taken in the late 20th century and the building appears unchanged. The book notes that the Globe was acquired by Fuller, Smith & Turner in 1908, and the name 'Fuller & Co Chiswick' is visible, fixing the photo date to between 1908 and 1913. The name 'H Smith' is visible above the Globe's door, and the 1911 census shows Henry Smith, licensed victualler, living here with his son, Henry William Smith (born Bengal India), daughter in law Helen Elizabeth Smith and barman James John (Trigger?). The Globe had 10 rooms. The roof projecting just beyond the Globe could be that of St Faith's Church; some rather smart terraced properties snake into the distance. 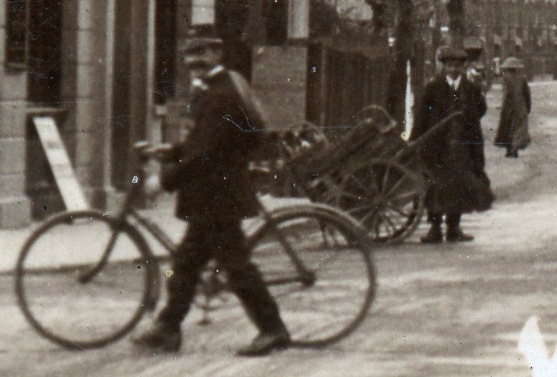 As well as the postman on his bicycle, a man or youth with a handcart is aware the photograph is being taken (see hig res scan below), but a lady with a straw hat is pushing her pram away from the photographer. To the right, parked in a driveway, is a Platt's van: a 1911 trade directory records Platt's Stores Ltd at 220 / 221 High Street, 103 Windmill Road and 50 Ealing Road, Brentford, and closer inspection shows the van was outside a shop, presumaby 103 Windmill Road. In 1911 James Gurney, canal pensioner, lived at 52 Western Road, Southall with his two unmarried daughters Ellen 39 and Hope 36.